As a fresh-faced electronic engineering student while the first Gulf War was raging in a far-off desert, I learned my way through the different families of 74 logic at a university in the North of England. 74LS was the one to use, the story went, because it’s quick and doesn’t use much power. At the time, there was an upstart on the scene: 74HC. Now that’s really quick. New. Exotic, even. Thus an association was formed, when you want a quick logic function then 74HC is the modern one to go for. It could have been a lifelong love affair, but over twenty years, after many factors of speed increases and some RF tricks with gates we wouldn’t have dreamed of back then, it’s over. There is a whole world of newer logic families to choose from, and while HC is still good at what it does, it’s well past time to admit that it may just have been superseded. A tendency to cling to the past with logic families is pretty harmless. Like [Adam Fabio]’s TIP power transistors they’re pretty cheap, still very much in production, and still do most jobs demanded of them excellently. But what prompted this piece was a far more egregious example of an old component still being specified: the RCA 40673 dual-gate MOSFET. Launched in the mists of time when dinosaurs probably still roamed the earth, this static-sensitive four-pin TO72 found a home in a huge variety of RF amplifiers, oscillators, and mixers. It worked well, but as you might expect better devices came along, and the 40673 was withdrawn some time in the 1980s. Unfortunately, nobody seems to have told a section of the amateur radio community about the 40673’s demise. Or perhaps nobody’s told them that many scrap analogue TV tuners of a certain age will yield a perfectly good newer replacement for free. Because even today, thirty years after the 40673 shuffled off this mortal coil, you can still find people specifying it. If you have a stash of them in your junk box, they’re worth a small fortune, and yours could be the bench with the throng of people at the next ham radio convention. A different but equally annoying manifestation of the phenomenon comes when the device everyone likes to specify is not very old and very much still in production, but the designer hasn’t taken the time required to check for a cheaper alternative. Nobody ever got fired for buying IBM, they say, but perhaps they should be fired for specifying an AD8307 logarithmic amplifier in an amateur radio power meter. Don’t take this the wrong way, it’s a beautiful chip and probably a lot of work at Analog Devices has gone into laser-trimming resistors to make it perform to an extremely demanding specification. But eleven dollars for a chip? When a cursory search will turn up Maxim’s MAX9933 which does a perfectly good job in this application at well under two dollars? Someone isn’t doing their homework. Is there a vital electronic engineering skill that’s being lost here perhaps? Back when the Internet was the sole preserve of boffins and Tim Berners-Lee hadn’t yet plugged his hypertext ideas into it, we relied on catalogs. Big paper-bound books the size of telephone directories were our only window into the exciting world of electronic components. If you’re an American yours was probably from Radio Shack, but for most UK-based hackers and makers who couldn’t get their hands on a commercial account from RS or Farnell that meant the Maplin catalogue. Before they moved in a consumer-electronics direction, they were a component specialist whose catalogue with its distinctive spaceships on the cover could be bought at large newsstands. It’s difficult to describe the impact of electronics catalogues in the ’70s and ’80s to someone who has known only the abundance of information from the WWW. These publications were our only window into the world of electronic components. They contained significant excerpts from semiconductor data sheets, and we read their wealth of information from cover to cover. We knew by heart what each device was capable of, and we eagerly devoured each new tidbit of information as it arrived. In short, when we specified a component, we did so with a pretty good knowledge of all the components that were available to us. By comparison, nowadays we can quickly buy almost any device or component in production from a multitude of suppliers. There are millions more devices available, and if RS or Farnell don’t have the part then Mouser or Digi-Key are sure to provide. The WWW allows us to find what we need in short order, and the miracle of global distribution means that we can have it delivered within 48 hours almost wherever we live. Which means that all the new devices are available to us, but we’ve lost the ability to keep on top of them. We’ve become information rich, but knowledge poor. 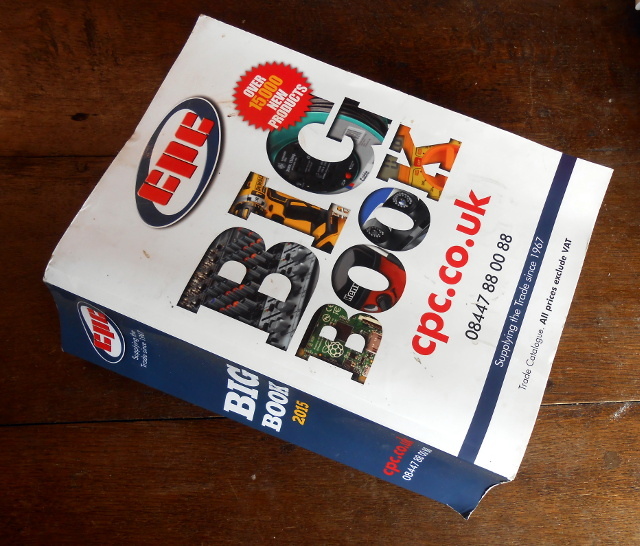 Printed catalogs still exist, but the sheer volume of information they contain forces brevity upon their entries and expands the size of the publication to the point at which it becomes an unwieldy work of reference. We therefore tend to stick with the devices and components we know, regardless of their cost or of whether they have been superseded, and our work is poorer for it. We need to relearn the skill of inquisitiveness when it comes to the parts we use, and to rediscover the joy of just browsing, even if the medium is now a huge suppliers’ web site rather than a paper catalog. Otherwise we’ll still be looking at circuit diagrams containing 74LS logic and 40673 MOSFETs in the 2030s, and that can’t be a good thing! There is of course also a slightly macabre alternative scenario. The highest online price we found for 40673s was over $30 each, so if a producer can make that kind of silly money then there’s a danger that RCA’s successors will see a business model in exhuming the corpse and re-animating it, thus ensuring that we’ll never be free of the undead. We need to make sure that doesn’t happen! 2 seconds of googling found me a local source that sells 40673 for 1,5€ a piece. Maybe not feasible for mass production, but sure as hell no problem for any amateur building a circuit with only a handfull of these…. ROFL !!! All your basses belong us! Correction: All of your bases ARE belong to us. Without the “ARE” it just doesn’t have that je ne sais quoi. Why are 40673’s so popular? My understanding is that they have a reasonably good NF and they allow you to build a combination mixer-amplifier in a single device. They’re used in an awful lot of ham designs and there seems not to be a modern equivalent. Of course, if you know of a good candidate for replacing the 40673, please share the details. “better devices came along” doesn’t really help much. Manufacturer names and part numbers would be better. What about the BF998 ? Sadly, the BF998 was end-of-lifed by NXP a year or two ago. Pissed me off. I used it a fair bit. I bought a few last-buys. Infineon supposedly makes ’em still, but the specs look different, and I have not tried theirs yet. They stopped a lot of >5GHz BJT too… I still have some stock at home. The BF998 from NXP is gone. Mouser still has some from Infineon (October 2018) but they are tagged “not recommended for new designs”. But the BF992 from NXP lives on for now. It’s also a suitable replacement for the 40673, and much cheaper even if you also have to buy a SIP adapter board to make it usable for a through-hole design. But that’s nearly the last of the dual gate MOSFETs left standing. There is also the BF1105R from NXP, but that’s a 7V enhancement mode part so it’s not a direct replacement for the 40673 or 3N211 or other classic parts. We’re probably about at the end of the line for discrete dual gate MOSFETs, so it’s time to start thinking about different circuit topologies. That line was ambiguous. It suggests “better MOSFETs” but really, it means other devices. It’s not that the 40673 is no longer being made, but that small signal dual-gate MOSFETs aren’t being used much. Transistors came along, and early shortwave radios were often lousy, the bipolar transistors overloaded too easily. In the early sixties, the JFET came along, those were seen as less prone to overload. Then MOSFETs in the late sixties, the dual gate ones making better mixers because of the second gate. The second gate also made it easy to control the gain when used as an RF amplifier. Yes, noise figure factored in, at least if you were doing something on VHF or higher. But the early seventies brought new ideas, even as the MOSFET reigned in hobby radio circuits. Use a better bipolar transistor, and put more current through it, and it didn’t overload so easily. Circa 1971, bipolar transistors also had improved noise figure. Use those Schottky diodes that arrived in the later sixties, and use four if them in a balanced mixer, often a better choice for an overload resistant mixer. Then IC mixers came long, as a stand alone like the MC1496 or in an IC that was a complete receiver. These were balanced mixers, the extra transistors irrelevant because it was in an IC. Balanced mixers had advantage. Not perfect, but acceptable for a lot of uses. Note that consumer electronics is where parts are mostly used, high end shortwave receivers or hobbyists don’t use that many parts. All the cellphones use ICs for the front end, I assume tv sets too, so that added to the disappearance of the RF MOSFET. For a lot of simple hobby uses, the 602 balanced mixer IC has taken over from theplaceof the MOSFET. If you need a low noise device for VHF or UHF, Gaasfets (I’ve got that wrong) are the way to go. So rf MOSFETs have a lot less commercial use than in the old days. Other things came long. I once found FM broadcast band preamps at the dollar store which used a single MOSFET each, I never got around to using the MOSFET, and that was twenty years go. Tv tuners used MOSFETs for a time, though I suspect the tv sets being tossed now came later. So that may no longer be a source, especially if you want leads. Some FM broadcast band tuners used them, so maybe car radios are a source. I seem to remember (correctly or incorrectly) that the earlier 1970’s FETs were junction FETs (JFET) or uni junction FETs (UJFETs) and not metal oxide substrate field effect transistors (MOSFETs). As far as my memory serves me the earlier (1970’s) FETS relied on the Hall Effect. My first memory of MOSFET was much later. I went on Digikey, armed with a 40673 data sheet, and there do appear to be Toshiba, NXP and ON Semi devices with similar specs. I searched on “MOSFET dual gate” and RF Fets, and found a bunch, including some BF9xx parts still available in SMD, with gains at 200MHz in the 23dB range and NF better than the 40673. BF908, BF992, BF994, BF996 all look like possibilities. and are currently listed on NXP’s website. As a RF amplifier with AGC input. I actually try to use as few different components as possible, to reduce storage requirements and simplify design. So I use 2N4401s and TIP122s for almost all of my projects. Same goes for capacitors: I only buy 1 nF, 10 nF, 100 nF etc. increments. I am guilty of rarely using op amps, and replace them with transistors whenever possible :) This is probably leftover from my war years: chips without datasheet are useless, while small signal transistors can do almost anything (amplifier, oscillator, switch, diode …), and pinout is easy to determine. And I love my germanium diodes – they allowed me to listen to crystal radio when electricity was out, and batteries were expensive or unobtainable. Information rich and knowledge poor is probably going to be the biggest obstacle in the next few generations. The “Little Box Challenge” is the perfect example of the problem this article speaks of. Inverters where 1-10w/in3 because that’s how everyone made them, any “innovation” was just making them cheaper yet in 1 year over a dozen groups made a >10x improvement using new technologies. Except improving the power/space density of inverters is a questionable goal. Inverters are not particularly space constrained. So when researchers optimize for power/space density, you get a >10x improvement, at the cost of a non commercially realizable design. Conversely, making inverters cheaper actually has a huge effect on the market. Inverters are a percentage of the hardware cost of a PV installation, and getting that price down DOES directly correlate into more rooftop solar. Don’t get me wrong, I will take any advances in tech I can get, science for the sake of science is worthwhile. But let’s not conflate a research project with a meaningful advance in the state of technology. Google’s big push wasn’t tied to changing the way inverters were made, their exact motive remain unspecified, but it sure as hell wasn’t to produce a commercially viable design. Maybe for use in CubeSats? You might have to specify what “this application” is in this case. The AD8307 has 50,000 times the dynamic range that the MAX9933 does (92 dB vs. 45 dB). They’re not really comparable chips. And the 8307 is available in SO8 which is a lot easier to mount than the uMAX/8 is. Granted, the AD part is a much better chip. In an amateur radio power meter application though the extra spec really isn’t necessary. It’s why the chip is $11, but that extra ten dollars or so is wasted in this case. This is what I don’t understand – it’s not really a “much better chip,” it’s just totally different. The 45 dB range (8 bits in voltage) devices are dirt cheap and super common. They’re perfect for automatic gain control, because you rarely have that much range in the AGC setup anyway. The 75+ dB range guys are very expensive, and most appropriate for something like a spectrum or network analyzer, or a power meter, where you have no idea what the input range is, and you’re trying to measure it. I’m a bit surprised that you think it’s “wasted in this case” – I’ve seen power meters built by hobbyists that actually have things to *increase* the dynamic range past the 80+ dB mark (a switchable inline attenuator). But anyway, if the input range of the MAX9933 is fine, that’s not a case for someone not searching. That’s a case for incorrect or poorly written specifications. The most expensive single chip I use today is the AD5061. I worked it out once, and it’s well over ten times the price of gold by weight. I’ve scoured DigiKey for alternatives, but there aren’t any that are a demonstrably better value. In some cases, part numbers become descriptors rather than absolutes. Decades after I first heard of a “1N34”, I saw an early ad, and realized why some fussed about it. All that time I knew it was a germanium diode, in most cases specified for it’s low forward voltage drop. I don’t think I’ve ever seen a “1N34”, a fairly bulky type diode. But the part number conveys what’s needed. There were other germanium diodes, yet to this day that’s the one specified. It doesn’t matter generally what you get when you order one, just as long it is germanium. 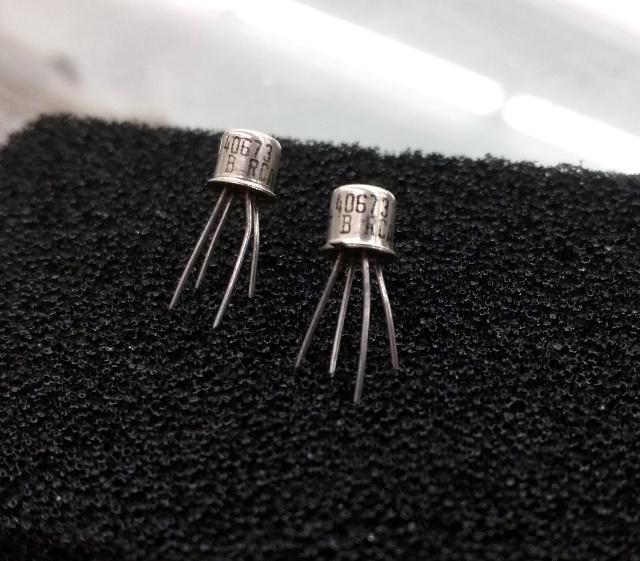 I’ve always assumed that if some company selling a small selection of parts, back when hobbyists bought from places aimed at them, said thy carried “1N34”, they offered some sort of germanium diode. Get a 1N82 if you wanted better frequency response, thy were found in UHF tv tuners. Likewise the 40673, which had gate protection and wasn’t as vulnerable as earlier MOSFETs. You know it’s a dual gate MOSFET useful up thru the VHF range. Even in 1973, I went through an RCA price list and found one that was cheaper, I guess it was the 4N404, something like that. I don’t know which was the chicken and which the egg. Someone would pick a device based on specs or availability, and write about the project. Others would use the same device, because someone had chosen it. Soon, the device was readily available from the hobby suppliers, if it hadn’t already. (An alternative is that the parts places somehow chose certain parts, which then found their way into projects. The CK722 was aimed at hobbyists, so that was the genesis, as was the 1N34, I assume in part because of Rufus P. Turner’s influence.) There was a vast selection, but hobbyists used a small subset, because the hobby suppliers were easier to del with, as well as the ubiquitous Radio Shack. The hobbyist, like the supplier, could keep a limited selection around, yet build anything within a certain level of specs. The beginner was at the mercy of the parts list, buying that expensive HEP IC because he wanted to follow the article exactly out of fear of making a mistake, not realizing the author specified that HEP replacement line part because it was very available. But a cheap 741 opamp was the same part. You moved further into the hobby and learned where you could substitute parts, you came to know the familiar solid state devices so you knew that diode was germanium and needed germanium, but that small NPN signal bipolar transistor in an audio oscillator could be just about any small signal transistor, so long as it was NPN, and even then a PNP could often work as long as you made adjustments. I suspect there were projects in the magazines that specified “common semiconductors” where the author used what he had on hand, then specified “2N2222” or whatever because they knew it was the sort of transistor needed, and was available. “””The hobbyist, like the supplier, could keep a limited selection around, yet build anything within a certain level of specs.””” – well said Sir. I would add my own observation that if digital logic can be done with NAND or NOR gates alone, analog can be reduced to relatively few parts as well. I think that basic blocks were amplifier, oscillator, and rectifier/detector. I thought is was diode, cathode, electrode, overload, generator, oscillator. (Make a circuit with me). Sorry “Jenny” stop trying to be provocative. I have however removed countless dual-gate MOSFETs from TV tuners. BF981, unless my memory fails me. But that’s scrounging, rather than specifying something new. There were always two camps. One wanted to be able to buy the exact parts specified, preferably at Radio Shack. They didn’t seem to care about price, just to be able to follow the parts list without trouble. Cost didn’t seem to factor in. Those people probably bought the kit if it was available. The other camp wanted cheap. They wanted to use what they had, or what they could scrounge. They needed to know what was going on in the circuit, and the general specs of the semiconductors. They’d look at a schematic and immediately start thinking about what part thy had which could be used, and where they could scrounge the rest. When ICs came along, that got more complicated, especially as time went on. A specialty IC would do a lot, but might not be easy to get, and wouldn’t have a direct substitute. You had to buy the kit, or hope the author would supply the IC. to convert from there to 455KHz, and complete 455KHz fm if strips. Really great UHF front end components. Now all gone, the average cellphone today has no useful parts. It’s less common to find am/fm radios, so no source of average variable capacitors. Cordless phones have moved up in frequency, and are using larger scale integration, a lot less useful for reusing the parts. TV sets being tossed are probably beyond the days of leaded MOSFETs, and most are so big that I won’t bother trying to open them right there on the sidewalk to extract a tuner module or board. And even if such neat things are still around to be tossed, it may ho directly to “e-cycling” where we don’t get ä chance at it. Agreed, I was lucky to be of the generation who got an ‘in’ on their craft as a teenager through the medium of scrap electronics with discrete components. All isn’t entirely lost though, you still can rob SMD bits. But it’s hardly easy and as you say greater integration means less diversity. But then again the young generation have opportunities we never came near. Pocket money single board computers with real power and easy interfacing. As a teen I made peripherals that sat on the bus of my Sinclair 8-bit home computer, what I’d have given for an Arduino or a Raspberry Pi! This is something I’ve had to use on an everyday basis for my work. I’m working with mass production, so if I specify an expensive part I have to justify the expense versus other options. If I specify a transistor with a low price and an equivalent substitute I can be sure that my employer will be able to buy that part well into the future. For me to do good work I have to have a good concept of the parts catalog and keep up with new parts from suppliers and the state of the industry. What should I be using instead of 74HC if I don’t want to go down the programmable logic route? AC is *significantly* noisier than HC because it’s switching huge currents (~tens of mA vs. mA). So blindly switching from HC to AC is a bit dangerous. There are quite a few “Logic Family Selection Guide” documents out there to help with this stuff. I guess it comes down to what you mean by replacement. Yes, a 3v3 family is not a drop-in replacement for a 5v part. But this piece was talking about circuit design; if you are starting with a blank sheet of paper and can pick the parameters of your circuit these days then you might well decide that you’re going to make it a 3v3 system instead of a 5v system and replace HC in your minds eye with a 3v3 family. Well, yeah, but that’s different than saying “don’t use HC.” That’s saying “don’t use 5V logic.” And that requires a lot more thought than just substituting a part on a board. Something that requires a fundamental redesign doesn’t qualify as a “replacement” in my book. VHC/AHC is much more of a drop-in replacement. AC less so, because you have to think a little about noise/increased current from the I/Os. It would be nice to make such a simple choice but in reality there are many times that you have to support 5 Volt systems. -Interfacing to older equipment. -The Micro controller is only available in 5 Volt or 3.3 Volt and has to interface with 1.8 or 2.5 Volt FPGA. Some of the new chips (ie 74xx) *are* drop in replacements for 5 Volt chips except for Vcc. The LVTTL spec is a 3.3 Volt (Vcc) chip that will interface with 5 Volt chips because the 5 Volt Vih is about 2.8 Volts and the 3.3 Volts LVTTL can output a Voh above 2.8Volts. Not the case for CMOS thought as 5 Volt CMOS Vih is above 3.3 Volts. One warning though there are now chips that use CMOS technology BUT have TTL spec IO. The voltage is arbitrary to the technology used from a IC design / manufacture point of view. As for the graphs that have the V(i/o)(l/h) spec for TTL/LVTTL/CMOS/LVCMOS and try to put these into groups like HC LVC etc – go have a google and you will see that there is confusion out there because there is NOT a direct co-relation in all cases. > while HC is still good at what it does, it’s well past time to admit that it may just have been superseded. The 74HC4066, 74HC4051, 74HC4052, 74HC4053 etc. are my go-to switch/multiplexers for 0…5V input signals. Extremely useful and they are dirt-cheap. Which exactly are the parts that have superseded the 74HC? If HC does your job then of course, use it. As you say it’s really cheap. I use a 4053 as a mixer as it happens, and in my application you start to hear the performance tail off somewhere above 10MHz with the HC part. It completely fails at about 70MHz. The VHC part is significantly better, still sounds good >30MHz and fails about 120MHz. I use HC parts as level translators with mixed 3v3 and 5v logic parts because there a good cheap option and do the job well. I suppose I could I should use a newer better part like a 10,000 gate 300MHz FPGA. As I’ve said in other comments and indeed above, HC is very cheap, available, and does its job very well. In my applications though it’s not quite fast enough, so has been toppled from its throne as the fast logic chip to go for by younger upstarts. For switches and multiplexers specifically, I believe the 74FST and 74CBT series have much better performance than the old 74HC devices. Don’t forget the IC Master and the EE Master. Those were big ones too. As a non-professional hobbyist, the issue comes from the specification and the tools we are given to compare. No, I’m very much *not* suggesting going to university. Unless you want to, that is. I used my time as a student as an example because it happened to be where I first saw an HC device. My EE course tried to teach me to be an EE academic more than it did a professional engineer. Which I think was not particularly good. I’m not having a dig at you [Jenny List]. It’s just that I think there *are times* when there is a legitimate case for older spec parts. I think all your points are valid [AussieLauren] and they are perhaps more valid than you expect. There are lots or reasons to use old’ish parts but first lets not blinker ourselves into seeing only the common consumer market. The common consumer market is making “disposable” products that need to be cheap cheap cheap and hence there is a strong motivation to use the best spec for buck components. Not all markets are like this. There are markets where product life expectancy and maintainability are more of concern and this introduces some other dynamics. 1) Spare parts. As a manufacturer or service agent you have to stock almost everything so reusing component specs that are used in other products / models can save a fortune. 2) Service staff education costs cold hard money. They don’t want to do the engineers job and find a better replacement by spending hours studying spec sheets. They want use the same ol’ familiar parts and know that if the product still doesn’t work then something *else* is the cause and not the new substitute they introduced. Removing variables from diagnostic processes can save a great deal of time and it’s the time that costs. 3) Risk factor. A part that has been in use for a long period of time has proven its worth. Sometimes *bad things happen* when you introduce new parts the aren’t detected until the product is in service and expensive to repair. 4) There are things that are not written in spec sheets. For example, I have never seen a faulty TRIAC. I have however on many occasions removed the remaining three legs and replaced the faulty TRIAC. The data sheet does not specify a blast shield. Now all this said there is perhaps a different case for the ol TL741 and the likes but still they are cheap. Some websites are absolutely woeful, bringing up results that have one word of your search in them, and in no way relate to what you need… eg: “brown cow” might return anything from brown dog to brown turd, and what you really want is a cow, and you would like it to be brown… but that result is somewhere within the 26 pages of which you can only see one and have no index associated (eg: 1=brown ant to brown box, 2=brown box to brown cat, etc). But searching for cow brings up an equally useless list! Digikey is one of the better ones, but still inadequate. I want to search for a connector that is small with 14 pins. I don’t care if it is dual or single row, who makes it, if it is gold coated, whatever! Excessively frustrating… what takes seconds in a catalog takes hours on a webpage. You’re right there, the power is in the supplier’s implementation of their search engine. And connectors seem to be not a focus of theirs in the way semiconductors are. I’m lucky I guess, I have connector specialist http://www.toby.co.uk/ not too far away. Detector diodes have modern replacements, but power germaniums do not, and I have searched hard! To provide fail-proof (as much as possible!) cell-reversal protection of series-parallel strings, without consuming any standby current, can only be done with diodes, and the lowest Vf diodes are power germaniums (Vf around 0.2v, whereas schottky is about 0.3v, and ‘normal’ diodes at 0.5 are woefully inadequate). I’ve only ever seen ancient devices advertised on eBay. Anyone know of *anyone* making new germanium components? Of any variety? I thought someone kept making germanium, but it may be as much as twenty years since I heard that. ECG/NTE replacement line might still include some germanium devices, I have seen people recently suggest it for replacements for early transistors. But perhaps that meant stock. Don Lancaster may have written something on the topic, though finding it might not be so easy. He’s collected most of his old writings on his website, tinaja.com, but I see no way to search through it. As I said, I’ve found quite a few on AliBaba. But caveat emptor. Where can I buy some UJT’s? A 555 does much of what the UJT did, I’m not sure if that’s why thy disappeared. You can a UJT synthesize with a couple of transistors and some resistors, there was an article in Ham Radio magazine about 1969 that described the process, but I’m sure I’ve seen it described elsewhere. Zombie components are alive and well in the aviation world. Redesigning to remove obsolescent components means going back through FAA certification. It’s cheaper buy craptons of parts while you can, and grade them later. (This all is much harder these days now that parts counterfeiting is a major issue). I’ve seen designs where a specific 1970’s era MOSFET was used, and only half of them worked to spec, so each part had to be run through a curve tracer and qualified. As far as I know, those boards are still being built the same way today. If you think civilian avionics is bad then don’t look at military electronics. That is exactly what I suspected. If you’re in aviation / military business, it’s to be expected you’ll have longevity requirements – but to design run-of-the-mill commercial products _today_ with two decades of availability requirements?!? Yeah, sorry, nope. Get real. You have no idea what the internet will look like in twenty years, let alone whether your part will still exist (here’s a wager I’m happy to take: its manufacturer WON’T, guaranteed: it will have bought / sold / merged / re-branded / spinned-off no less than thrice). It’s also guaranteed YOU (if you’ll still be around, and that’s huge if) won’t be making that exact same product in two decades. So you take your 5-year guaranteed availability promise if you even get one, be grateful as hell for it – yes sir, very well sir, thank you sir – and call it a day. Does the TI-83 calculator count in your bet? All those newer techs are great; it’s often possible to find *exactly* what you need with the right search-terms and (a lot of) patience, but if only one manufacturer (or some obscure seller on some obscure website) is selling it, then for many purposes it’s basically useless, even *if* you intend to purchase quantities great-enough for repair-jobs twenty years down the road. Whereas… many (especially older) devices can be cross-referenced with pin-compatible equivalents from other manufacturers, or, if not *exactly* the same, there’s info on how to interchange ’em… Some of these newer devices are more like “epoxy-blobs” that just happen to have markings and (vague) data-sheets. OTOH, look at microcontrollers… there was a time each incarnation had at least two manufacturers, not only pinout-compatible, but also *functionally/code* compatible, they’d have the same registers, the same pinouts, same peripherals/addresses… Even PALs/GALs were manufactured by multiple vendors, again code/programmer-compatible. Is there even the vaguest hope of something like that for FPGAs? ARMs? I repaired a big brand audio Amp late last year. I was only a year or two old but had 1980’s parts in it. I found some replacements *eventually*. I’m guessing that the big brand company went to a semiconductor manufacturer and made a special order of the old spec part so that they could control the life expectancy of the consumer device. ie – they can fix them under warranty because they have stock of the old spec part but good luck to anyone else. IIRC, the 40673 was regarded as an upmarket MOSFET back in the day, while ‘economy’ designs used the 40841. Happened to stumble across two of those in my old bag of bits just the other day. Given these are devices from a past generation, the BF998 others mentioned certainly seems to fill the bill for a replacement and you can buy them by the bag-full from the usual Asian suppliers. About $US2 for 20 x BF998 is a great price if you need them. For a project like a VHF AM airband receiver, say, they seem like a useful choice. Along with a single chip AM IC (TDA1072 for example, just to stay in the right era) for the bulk of the design, the BF998 or 40673/40841 could be nice as a VHF mixer driven directly from an SI5351A, converting airband to 10.7MHz before the second conversion to 455kHz in the TDA1072. The MOSFET’s noise figure of about 1dB coupled with a fair IIMD3 performance level (0dBm?) should give a reasonable result. The most commonly seen alternative (NE612) is probably equally suitable, but a bit more expensive. Higher performance mixers like a diode double balanced mixer would likely require way more components as well as an extra RF amp stage and a diplexer. But in all fairness, still a dodo of a component. Definitely not for new in-production designs. And people wonder why I hoard old analogue TV tuners.. Heh heh. Also they are handy for making DIY SETI rigs as they can hook up to Sky LNBs and with added Pi can scan for TLPs and atmospheric anomalies as well as tracking cloud patterns. I still sort of miss the LM3909, an 8-pin DIP dedicated to…blinking an LED. Seriously, they made a chip just for that. Now it takes a minimum of an ATmega168 to blink a LED lol. How times have changed. I probably still have LM3909 here and some LM3914’s and LM3915’s. It didn’t *just* blink the LED, it used persistence of vision with very short pulses so the LED looked bright and at the same time, used very little power. Just goes to show how long the “blink the LED” has been around! Like the “Hello World” of programming. I remember some schematics used a 3N211 for a dual gate MOSFET. But it’s like the 40673 – it’s getting rarer and more expensive. Here’s a guy who sells ’em and the BF MOSFETs too. I appreciate your criticism not because the criticism is correct, but rather it is an accurate observation about the lack of part availability. The specific reason that most of your criticism is not correct is because there are some numbers and parts that are so perfect for their required design purpose that it seems more work or cumbersome to redesign using modern parts. They are an elegant solution for what is needed. Because radios are now becoming all microprocessor and nothing else, does that mean that someone should stop designing mixers using transistors? I sure hope not!. It should also be noted that there are quite a few tube circuits being built these days for one reason or another, and I won’t even broach the subject of the nixie tube clock craze that has everyone scouring their basements for sources! It’s not just a question of designing with available parts (I whole heartedly agree with that), but keeping some numbers alive because there is nothing quite like that part number that has come along to replace it. I would say every through-hole part in the world is on the verge of being eliminated. Does that mean everyone suddenly needs to not design with through hole parts anymore? I submit that it’s not the hobbyists fault for wanting to use these parts for one reason or another. Another example is the famous and storied 2n3866 transistor made by Central Semi. For a small RF BJT power it can not be beat as it can withstand (but don’t try that at home!) key down into infinite swr. Compare that with some power mosfets that seems like if you breathe on them wrong they will expire. I encourage everybody to design with that part so it will be continue to be made! The other elephant in the room is that the military does need parts also. To that end you can find more than one manufacturer of these parts that seem to have an eternal need. Rochester electronics is one such place that will supply parts albeit expensively until the cows come home. https://www.rocelec.com/manufacturing. Something curious happened with the recent TI acquisition of National Semiconductor. A number of old National parts that had been discontinued by National showed up in TI’s catalog as available with datasheets, pricing and not EOL. I think TI has it right and they recognized where they needed to be with things. They apparently have the capability to run a line for the day to get a few thousand chips and inventory them and put them up for sale. The same thing happened when AD acquired Burr Brown. Most of what Burr Brown was making was carried over to AD with nary a change in part number. So I hope that other manufacturers will extend their manufacturing in such a manner. Another example would be lm324. Aren’t there countless better chips? That thing is everywhere and not very many others can run off a single supply which the lm324 was famous for. Then there are the truly weird parts that may not see the light of day again. But who knows when someone will quietly bring them forth again. The 1n34a is such a part that does not seem to see much need outside of hobbyist radio circles. Fondly called “germs” by a few, I can recognize them by sight. Wouldn’t you know, musicians have started to use those in some of their guitar pedal projects. So who knows, there might be a demand for them again! Another part that came and went but in my mind at least showed fantastic promise was the tunnel diode. I personally do not understand why this part did not take off other than it is so dog gone hard to understand how they should work! So, my point with this long winded reply, it’s not cut and dry as you would like to make it seem to be. BTW, the logical “replacement” for the 40673 would be the 602 chip mixer (at least in mixer applications). But I had an acquaintance buy a large number of rails for that part when they had a justifiable scare that those were headed to be EOL’d. The 602 is another part that promises to never go away and become a ‘zombie” part if it does! BTW, for anyone who has to deal with a 3n211, observe every ESD precaution in the planet with that part because they are extremely susceptible. That’s why RCA put the diodes in and called it the 40673 ! !